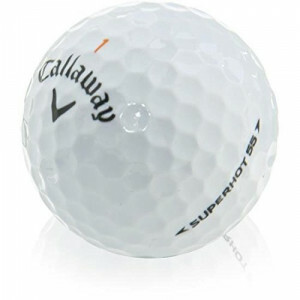 Callaway SuperHot 55 are currently selling in pro shops for $49.99 a dozen. Save big buy purchasing from Lost Golf Balls! The SuperHot 55 aerodynamic design is designed to provide low drag and penetrating lift that keeps the ball in the air longer with a strong flight. This provides long distance off the driver all the way through to the short irons. If you've got a slice or hook, the SuperHot 55 are made for you. The soft mantle and cover system are designed to help you hit straighter, longer shots. Callaway have engineered the cover and mantle system to work together to create low side spin, with the result being reduced slice and hook. The very low 55 compression lets you compress the ball with soft feel. Ideal of mid-range swing speeds. Hi guys, yes these lost balls are the best you can buy because at the weekend I visited some other places that sells golf balls and they were no where good as these are 4 the PRICE. ... Read More. Hi guys, yes these lost balls are the best you can buy because at the weekend I visited some other places that sells golf balls and they were no where good as these are 4 the PRICE. These guys delivered on quality and pretty quickly ( I should have picked them up in hindsight). Balls are mint and I’ll definitely use this site again! Super professional company with excellent service and great quality product. Great quality balls at a good price and super fast delivery! Balls always in condition advertised. Took 10days for delivery which is only reason for not being 5*. very pleased with the product, service and delivery. thanks. Supplied balls much better than expected.